It’s Friday the 13th and Halloween is coming up fast. 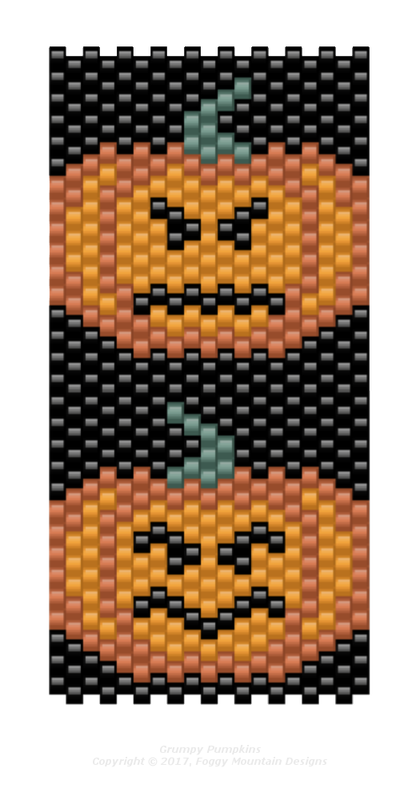 Let’s do a cuff with some grumpy pumpkins in odd-count peyote stitch this week. You’ll need two orange, a green and black. It’s a repeating pattern. Work until it fits your wrist and add (your choice) of clasp. Click to enlarge, then right-click to save to your hard drive. You can also widen the cuff and add a border on each side, if you wish. Have fun and happy beading!